• Drinks: $5 drafts, $6.50 mixed drinks, $6-$8 wine. 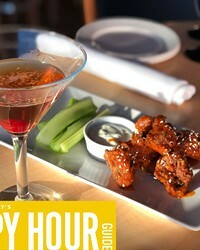 Food: $7.50 bar burger, $8.50 appetizers. With sustainable seafood and great views of the Deschutes River and the Les Schwab Amphitheater, Anthony's has earned its reputation as a favorite local spot. The seafood grill has been a staple in the heart of the Old Mill for over a decade, featuring a broad selection of Northwest wines and happy hour every day, 3-6:30pm. Anthony’s has been a staple in the heart of the Old Mill for over a decade. The menu features fresh sustainable seafood with a broad selection of Oregon and Washington wines. Great seafood and an awesome location in the heart of it all on the Deschutes.